Is Vintage 2008 The Next 2002? As those who follow The Finest Bubble will know, we have long been fans of the 2008 vintage. Our romance began last year with the consecutive releases of Louis Roederer Brut Vintage 2008, Moët & Chandon Grand Vintage 2008 and Taittinger Brut Vintage 2008. A year that favoured all the grape varieties, our first taste of these three Grandes Marques 2008s were a testament to the favourable weather; elegant and vibrant with delightful acidity to boot. Thus, when Pol Roger launched their Brut Vintage 2008 earlier this year, we were already fanatical about this astonishing vintage and their release was the final nail in the coffin of our affection. Pol are claiming it to be one of their “greatest ever years” – and the more we taste, the harder we find it to disagree. After reporting last month that 2008 is already the most exciting vintage of the century since 2002 (read more here), we decided to put this hypothesis to the test – with a blind tasting of course. Whilst only a few are readily available on the market, we managed to assemble a representative range of fifteen champagnes from 2008 (mostly Grandes Marques) and decided to include the newly released Krug Grande Cuvée Edition 164 NV – based on 2008. 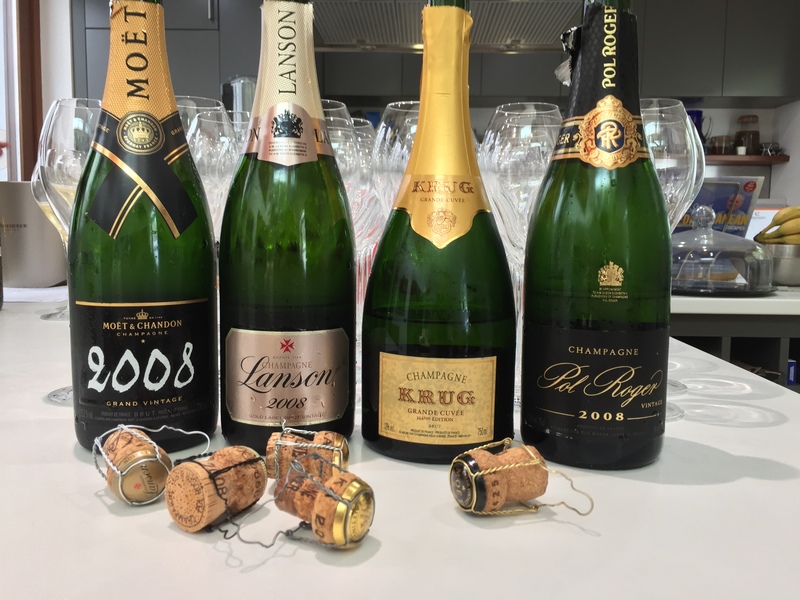 Although technically a non-vintage and also a prestige cuvée, no blind tasting is complete without a glass of Krug! 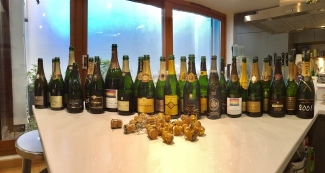 The final line-up was a grand selection of twenty-three champagnes. For fair comparison to a vintage we know to be outstanding, we included five 2002s and threw in some last minute surprises to keep the tasting panel on their toes! 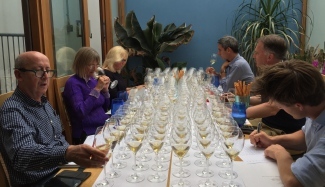 Tasting alongside TFB were Jancis Robinson MW, Giles Fallowfield, Peter Crawford and Matt Segal. Before discussing rank and preference, it is worth noting that it is somewhat arbitrary to directly compare two vintages with six years age difference. Whilst it is useful as a loose guide of quality, the 2002s – with significantly more bottle development – will inevitably display more complexity and ageing characteristics than the younger 2008s. So rather than a direct competition between vintage, this exercise was more a useful comparison of style. So, perhaps unsurprisingly, the 2002s came out on top! As mentioned previously, this result may not be a huge surprise. 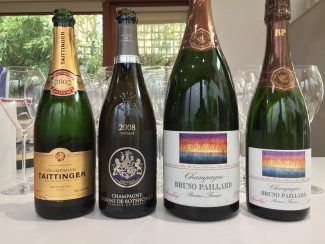 They’ve spent significantly longer ageing and developing that sought after complexity, and there were also only five in the tasting (one of which was a magnum). Having said that, the difference was not huge: 17.8/20 vs 17.0/20 when taking averages from six different ratings is by no means a remarkable margin. 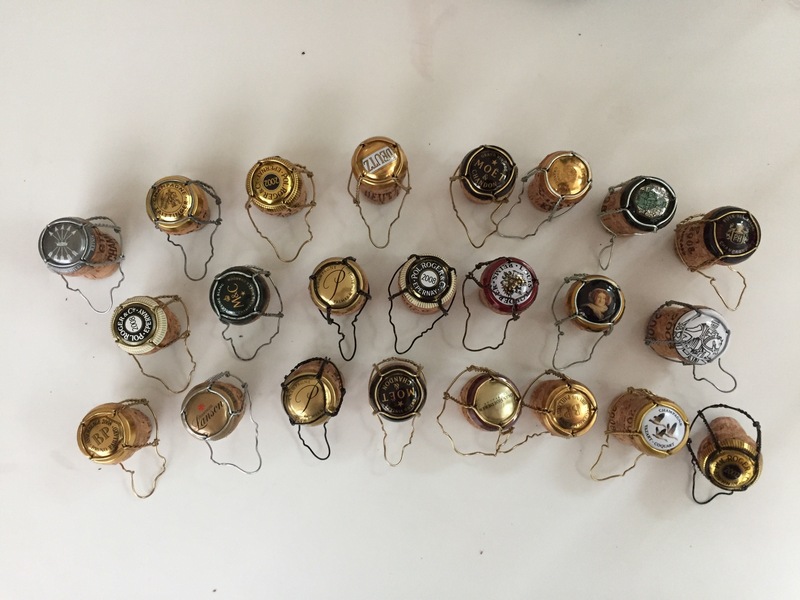 Aside from one or two obvious standouts, the 2002s were not immediately detectable throughout the blind tasting and given the expertise of the palates taking part, this is a promising outcome for the 2008s. Onto individual champagnes and the overall winner: Taittinger Brut Vintage 2002. A simply stunning champagne that has developed with intrigue over the last few years. It’s identity wasn’t immediately apparent as it tasted so incredibly youthful, but it had layers and layers of fruit complexity that were indicative of the vintage. Served fifth in the tasting order, its enjoyment by the panel was evident from the number of times it was requested for a ‘re-taste’! Bravo. Moving down the podium and the top 2008 was Louis Roederer Brut Vintage 2008. The man behind the champagne, winemaker Jean-Baptiste Lécaillon told TFB earlier this year: “2008 is almost my dream” and it will be ours also if we keep drinking Roederer. With astonishing acidity and a finish that lasts forever, this is one of the best testaments of the vintage – we even wrote ‘2002?’ in our blind tasting note. This decadently displays all of the characteristics for which 2008 is so celebrated already. Moving further down the table, new Krug Grande Cuvée Edition 164 NV rather predictably placed in the Top 5. Also of note is the ranking of the two surprise magnums – Palmer & Co 2002 and Bruno Paillard 2008. Both within the top third of the table, this is yet another example of the quality of champagne served from larger format (interestingly, both magnums were repeatedly requested for re-taste). 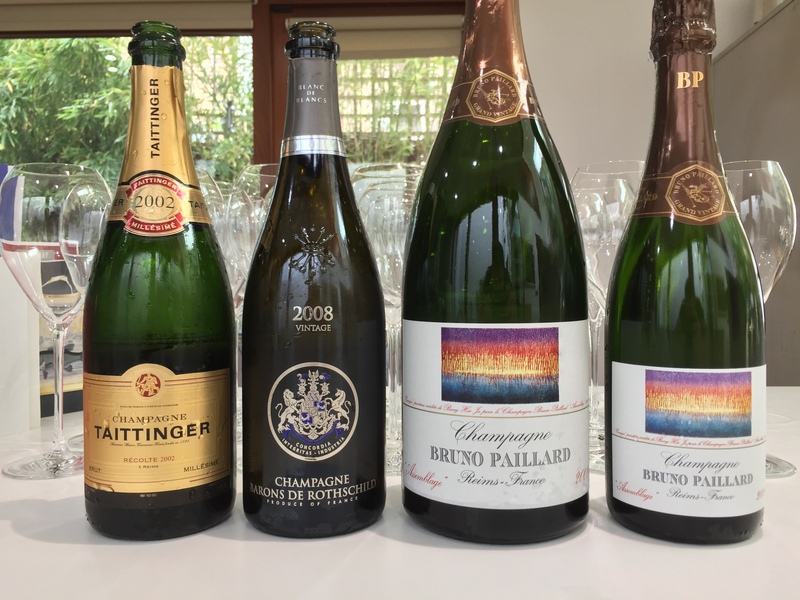 The difference was proved more bluntly by Bruno Paillard 2008 – blind tasted from both bottle and magnum, the panel preferred the magnum (17.5/20 vs 17.2/20). The other two surprise entrants – Moët & Chandon Grand Vintage 1998 & 1988 – were easier to distinguish. 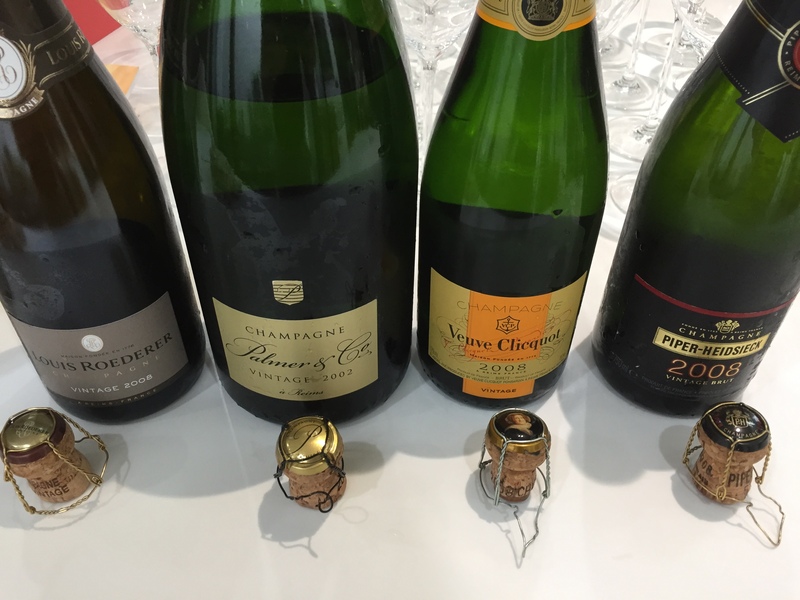 Interestingly, the champagnes that most and least divided opinion were both Pol Roger’s. 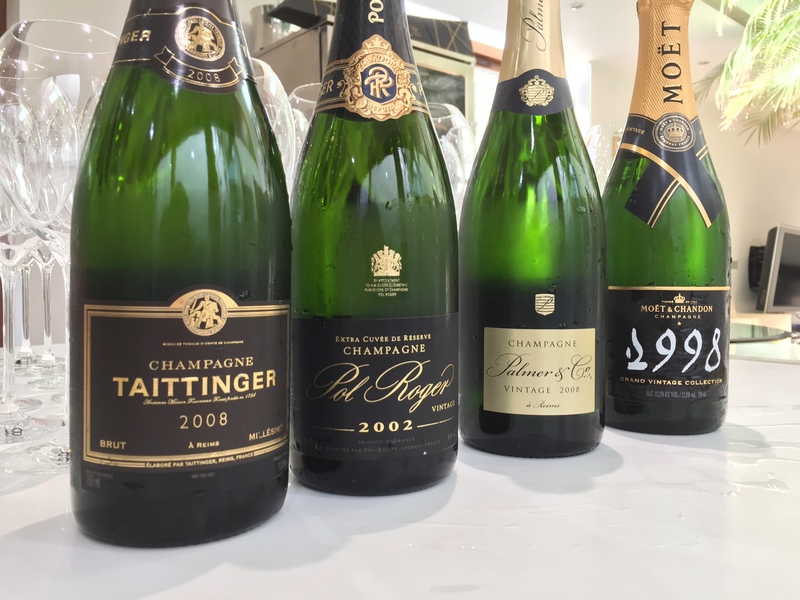 Pol Roger Brut Vintage 2002 had a score variance of 3.5, whereas scores for Pol Roger Blanc de Blancs 2008 ranged by just 0.5. Once the league table was announced, it was revealed that the Pol’s had placed surprisingly lower than one might expect. Checking our notes against what we now knew the identities of the champagnes to be, a pattern of phrases such as “muted” and “lacking fruit” emerged. As such, we decided to conduct a re-taste of the Pol Roger’s, which can be read below. Overall, this proved a deeply insightful tasting. Whilst not a direct competition between the vintages, it proved that champagnes from 2008 can more than stand up to their counterparts from 2002. 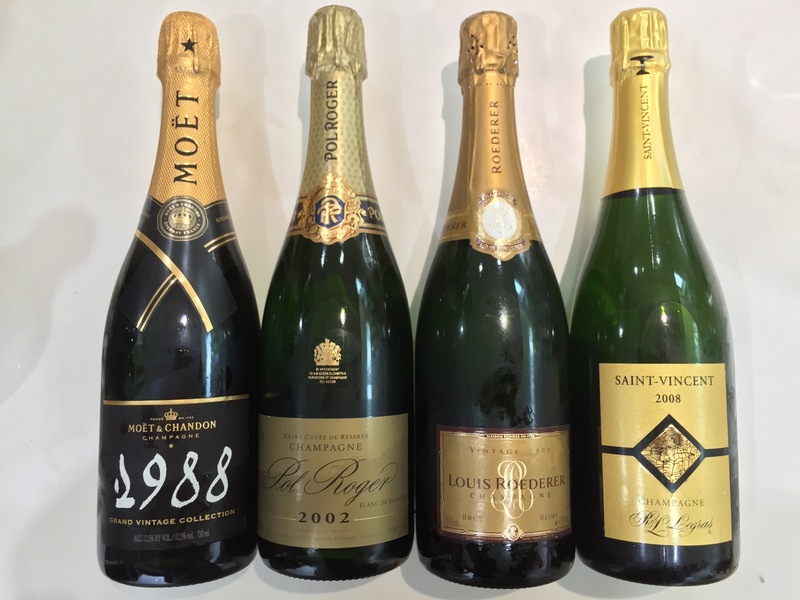 Although perhaps not immediately detectable in a blind tasting, the scores show a preference on average for the 2002s; a minute difference that is surely a result of bottle development. Time will tell how these 2008s age, but the initial signs are positive: 2008 is exceptional now and its potential is limitless. When matching our notes with the now revealed identity of the champagnes, an unusual pattern of uncharacteristic comments for Pol Roger became apparent. 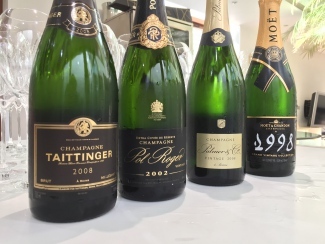 As such, having tasted these champagnes previously and confident of their true quality, we decided to conduct a re-taste of the Pol Roger Blanc de Blancs. The first bottles appeared to be incredibly muted and displayed an unusual lack of fruit – signs of potential cork taint. Tasting notes for the second bottles are provided below, however their original scores were maintained in the averages to protect the integrity of the data. 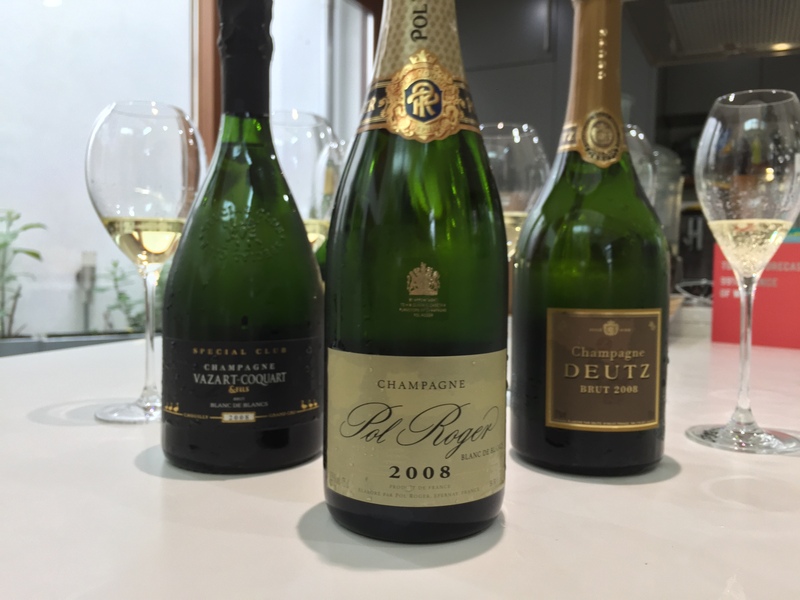 Pol Roger Blanc de Blancs 2002 Immediately different nose, much more giving and generous and leaping out of the glass. Masses of creaminess and crème caramel and vanilla, really intriguing and leading you in to want to taste. Wow, bundles of fruit and richness. Apples and ripe plum flavour developing into really ripe gooseberry; so much vanilla coming through and lovely lees character and length. Acidity seems so integrated. Has to be an 18.5, perhaps even an 18.5+. Pol Roger Blanc de Blancs 2008 Lots of fine bubbles. Initially after opening has a chalky cellar dominance on the nose that goes after a few minutes and leaves loads of cooked ripe apple character. Good balance, has loads of fruits and acidity; very refreshing but balanced. Has loads of vanilla richness – a character hardly detectable in the first bottle – and so much fruit. Ripe apples dominate with complexity coming from lees character and already hints of richness and that crème caramel right there. Length is great. Solid 17.5, with potential for 18.0. All tasting notes provided are The Finest Bubble’s. Champagnes are listed in the order served on the day. Dark rich colour with loads of bubbles. Hint of slight reduction and burnt notes with bundles of pear and apple complexity. Quite a lot of sherbet and nice refreshing acidity. Lovely peach flavours that linger and a slight roundness to the finish. Packed full of ripe peaches. Less fizz, so seems a little older and less acidity. Loads of lemon and lime and cooked apple. Seems quite soft and round. Drier finish; lower dosage? Lots of brioche and toast on the nose. Very floral with loads of acidty and masses of fruit and concentration. House style easily distinguishable. Best of the bunch for TFB. Yum! Very light with delicate apple and lemon flavours but lacking in abundance of fruits. Good acidity and long length, quite dry and a bitter finish. Bundles of caramel and a delicious toastiness right from the off. A real developed lushness and loads of ripe cooked apple notes. Great length and goes on and on and on. Lots of apple and lemon aromas. Great mouth-feel and a refreshing acidity that seems to go on well. Bundles of peaches and apricot but lacking complexity. Quite dry. Very light nose with a hint of apple. Quite tight but lots of grip on the palate. High acidity, this is quite simple and punchy with a slightly bitter finish. Ripe fruit abundance and hints of cellar-aroma. A bit burnt on the palate and some roundness making it seem a little clumsy. Quite a creamy nose. Good fruit and great length on the palate. Acidity is all there and a hint of sweetness indicative of Pol. Very good. Loads of development noticeable on both nose and palate. Great bubbles and loads of bread and caramelised character. Impressive length with a hint of smokiness on the finish. Bundles of ripe apples and lots of fresh acidity. A delightfully youthful freshness and a hint of roundness on the palate. Clearly a 2008, potentially Pol? Bit of reduction on the nose. A peppery flintiness on the palate at first. Quite round with ripe apple fruit and a richness from the sweetness. Really quite full-on with a long, dry finish. Strong colour and seems to have bundles of fruit. Lots of peaches and peach stone character. Quite soft acidity and such long length. Is this a 2002? Perfumed and aromatic, this is very rich and full and lush and quite rounded and big and great length and power. Bit of sweetness both helps and spoils it. Lovely restrained apple and peach notes. Quite subtle on the palate, but loads of acidty and just a hint of sweetness. Hints of those lush ripe caramel creme brûlée notes and lovely rich fruit flavours. Has a slightly short finish. Fruit density perhaps implies 2002? Herbaceous and medical aromas. Smokey reductive style (Moët?) and seems a little soft and heavy. Slightly strange character on the finish, but very good. Loads of apple fruit and high acidity. Quite nicely balanced and long length, with some sweetness on the finish. Could this be Pol 2008? Lots of development. Quite ripe, with rich and lovely full fruit character and great length. Superb! 2002? Hint of reduction. Some jasmine flavour and good acidity. Seems a little rounded and a bit sickly. Good, not great. First bottle not right. Second bottle had great apricot flavour and chalky intensity. Much better: 17/20. Bottle not quite right. Strange aromatics and very muted. Seems to be lacking of fruit. Lots of lemon flavour. Quite tight with a bigger structure on the palate. Great acidity and long length.